Las Olas Riverhouse is one of the most recognizabe buildings in Fort Lauderdale. Its views of the riverfront and the Atlantic Ocean are unparalleled. The height and architectural design afford its residents not only incredible vistas but also a premier location in what is considered the Venice of America, Fort Lauderdale. Las Olas Riverhouse had world reknown interior designer Steven G. Interiors appointed lobby and is a resort style development that leaves little to be desired in city living. The fitness facility is a completely cutting edge, beautifully designed 10,000 square foot glass walled structure with outstanding river views. las olas grand - 411 n new river drive. Adjacent to the main Las Olas Grand tower, the seventh level is devoted to the private Resident's Club offering unique and luxurious facilities. There is The Forum, a large Sports/Recreation room with several TVs, as well as a bar, Billiards/Card Room with a beverage locker, Library, Reception Gallery for private parties, fully equipped Fitness/Aerobics/Massage Center that overlooks the New River and the Pool Deck with lush landscaping and luxurious facilities, all offered exclusively for residents. 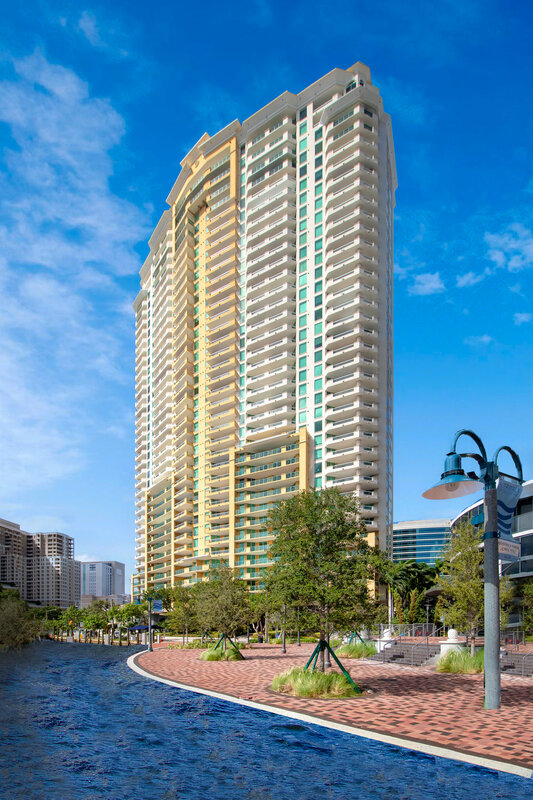 Nu River Landing is a 25 story high-rise condominium high overlooking the New River in the heart of downtown Fort Lauderdale. Nu River Landing is what luxury living is all about! Hop on the Water-Taxi in front of the building and take a ride through the city. Easily walk into downtown’s lively entertainment district, walk to Las Olas Boulevard for shopping and fantastic restaurants, or just lounge around your new home and enjoy the endless Amenities Nu River Landing has to offer. Thinking of buying, selling or leasing? Contact Alex Smythe with D'Angelo Realty Group - #1 Real Estate Brokerage in Downtown Fort Lauderdale Condo Sales! We would love the opportunity to help you. Please feel free to contact us at 954-471-9098 with any questions you might have! 350 Las Olas Place condominium is in the center of Downtown Fort Lauderdale and is a commanding residential presence in the Las Olas district. Work, play and relax at this incredible resort style development in the heart of it all. The rooftop of 350 Las Olas Place is one of the main attractions that the building offers. The roof houses the building’s pool, theater, and health club, as well as events space. Among the features that come standard in 350 Las Olas condominiums are nine foot ceilings, walk in closets, granite countertops, stainless steel appliances and glass doors that open onto spacious balconies overlooking the Fort Lauderdale skyline. The 350 Las Olas Place condominium is a 5 star building! Activities abound in the neighborhood – between rooftop sunbathing at the gorgeous infinity pool to sunbathing on the beach, or dining by your doorstep at Las Olas Boulevard or the Riverwalk, you won’t be disappointed. 350 Las Olas Place is located within the commercial area of Fort Lauderdale, 10 minutes from Interstate 95 and 15-20 minutes from the Fort Lauderdale International Airport, offering the rest of South Florida and beyond at your fingertips. Business center with conference facilities. The WaterGarden is one of the most sought after condominiums in bustling Downtown Fort Lauderdale. Its architecture creates a distinctive skyline and it alters its look with the setting of the Fort Lauderdale sun. The innovation in design is inviting and many residents appreciate the pedestrian living that is possible from the WaterGarden property. For further relaxation there is a beautifully landscaped recreational area with deck, pool, cabanas and holistic spa. Along with the beautiful pool and hot tub area, a sports lounge and billiards is on the premises as well. For those who are fitness conscious the fitness facility is completely state of the art with saunas and massage tables. The WaterGarden’s interior features include sliding glass and embossed interior doors, code approved hurricane glass, central energy efficient air, alarm system and oversized closets. Kitchens and baths feature granite countertops and imported marble.